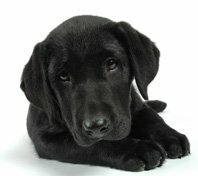 Black Labrador puppies are many peoples idea of the perfect pup and certainly anyone seeking to own a dog with a sweet and lovable temperament could do no better than acquiring a black Lab. This lovable temperament has made the Lab one of the most popular dogs for the family home. Labs may startle strangers, but not with their aggression. The naturally friendly dog may even stand on its hind legs and lick the stranger. It is just his way of being friendly. Pups are usually adopted at the age of between seven and 10 weeks and will become a much loved member of the family and a delight to parents and children alike. Black Labrador puppies will grow to between 50 to 70 pounds, so they quite a large dog. But rest assured, despite their girth, Black Labs will remain as playful and loveable as ever. Black Labs have the temperament to make them safe alongside small children. They are friendly dogs and not territorial. It is also safe to feed Black Labrador retrievers by hand, and if you need any reassurance about just how gentle they are, just wait until one licks you. Their licks are certainly soft and gentle. Indeed, Black Labs have been know to be able to carry an egg in their mouths without breaking it, but they are no mere lap dog. 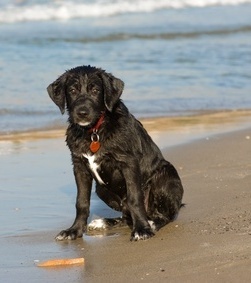 Aside from their gentle national Black Labrador Retrievers love to play and enjoy plenty of activity. Black Labrador puppies also love to share with their owners a sense of achievement. That could mean your Black Lab proudly depositing a bird it has caught at your feet. You may not appreciate this “gift”, but the Lab is only demonstrating how much he loves you! Anyone one seeking to own a Lab must realise that their new pet will need careful grooming. Black Labrador will cast their fur, but thankfully not as much as Yellow Labs. In colder environments they may cast their fur twice a year. So it is important to spend time grooming your dog to ensure the fur remains healthy. Before deciding to buy a Lab its is sensible to contact local breeders and kennels to learn about the breed. Labradors can be quite independent minded so it is important and to leash and train them early. Then both you and family will be the proud owners of a most lovable pet.